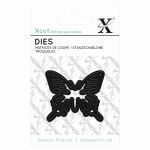 A pretty mini butterfly die by Xcut Aprroximate size: 34 x 29mm Compatable with most die cutting systems. A pretty mini butterfly die by Xcut Aprroximate size: 47 x 40mm Compatable with most die cutting systems. A 3 piece Dragonfly die by Xcut Aprroximate size: 50 x 80mm when assembled Compatable with most die-cutting systems. 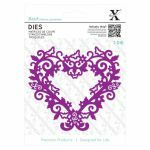 A large filigree heart frame die from Xcut Aprroximate size: 115 x 115mm One large die included Compatable with most die cutting systems. 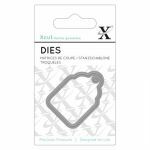 A cute mini Gift Tag die by Xcut Aprroximate size: 39 x 26mm Compatable with most die cutting systems. 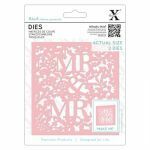 A set of 2 mini Gift Tag dies by Xcut Aprroximate sizes: 50 x 33mm & 33 x 22mm Compatable with most die cutting systems. This pack contains 5 dies. 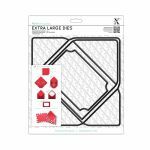 Approximate size: 140 x 110mm Compatable with most die cutting systems. 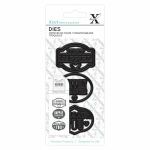 A Heart shape Lock & Key die by Xcut Aprroximate size: 40 x 40mm Compatable with most die cutting systems. This pack contains 2 dies. Approximate size: 148 x 100mm Compatable with most die cutting systems. A pretty mini leaf die by Xcut Aprroximate size: 50 x 27mm Compatable with most die cutting systems. A small Maple Leaf die by Xcut Aprroximate size: 36 x 45mm Compatable with most die cutting systems. This pack contains 2 dies. Approximate size: 108 x 115mm Compatable with most die cutting systems. 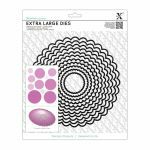 A Rosette die by Xcut Aprroximate size: 40 x 29mm Compatable with most die cutting systems. A very versatile set of dies 11 sizes included Approximate size: 45 - 195mm diameter Compatable with most A4 die cutting systems.